I was dreading my checkup today. Seriously. The last time I went for my checkup, my doctor told me that I have to go through the glucose tolerance test - in short OGTT. This is the test that all expectant mothers are terrified of. We have to fast overnight, have our blood drawn before the test, gulp down a glass of overly-sweetened glucose drink, wait for an hour and then have blood drawn again after the test. Lucky I'm not squirmish about the whole blood-drawing thing or I would have another thing to be terrified of this visit. To tell you the truth, I am not really happy about having to do this test. I was close to rolling on the floor in despair when I was told that I had to do it - c'on! With my history of having PCOS, what other results can I expect??? Plus, my baby's size is right for her age (33 weeks, fyi), Khayla was born at 2.81kg (a.k.a. normal size) and I declared that none of my family members have diabetes. So what's the point of going through this torture? So, pfft. Welcome to the world of being pregnant in Malaysia where doctors insist that we go through the whole process regardless of my previously healthy state of pregnancy. No chocie, but to prepare for it - The day before I went for the test I drank a lot of water. Waaaayyyyy a lot more than I used to drink. You see, I am not much a fan of H2O. This week when I keep a food journal of my food and drink intake, I discovered that on average I only drink 3 glasses of plain water per day and another 2-3 glasses of flavoured drinks (Horlicks, Milo, coffee, milk, etc.). In total, it's probably just 1L of drinks per day.WOAH! My doctor would certainly raised the roof if she knows that! Anyway, back to my efforts to err, dilute my blood sugar level I guess, I drank bottles of mineral water one after another. Being in a meeting where the toilet is just across the meeting room helped a lot. By evening, I started to feel unwell. My head felt dizzy, my body felt achy all over and I felt terrible - like I was about to come down with cold / flu / fever. It was strange because in the morning I was perfectly fine but after gulping down 2L+ plain water (the only time I took flavoured drink was the during lunch - I had Juiceworks banana+chocolate blended juice), I started to feel unwell. I googled my symptoms and guess what, I had accidentally detoxed my body! So as early as 8.30am, we were at the hospital. Suami Terchenta had to leave to go for his mid-term so I had to look after Khayla myself. Luckily she was in a good mood today - she woke up without a fuss and was really thrilled that she didn't have to take bath as we were already late. 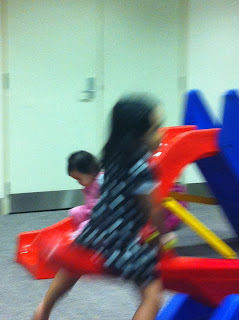 At the hospital, she enjoyed herself playing slides in the playroom and hide-n-seek in the playhouse. But when other kids came, she got all shy and stuck by me watching them play. Back to the test. I was so desperate to skip the test to the point that I decided to cheat - I sneaked a packet of M&Ms in my bag and was thinking to surreptitiously swapped the drink with a lot of M&Ms. Both are sweet and made of sugar, right? BUT.... this time around, a nurse lingered around to make sure that sneaky Moms like me finish those drinks without any hanky-panky tricks. Sigh. What to do? I contemplated my unlucky situation sadly, took a deep breath and chugged down the drink while pinching my nose desperately trying to ignore the sickly sweet flavour. Based on my experience, o expectant ladies out there, bring your own water bottle with a slice of lemon to give it a tinge of sour-ish flavour to counter the over-sweetness of the glucose drink. The hospital may provide plain water as well, but my lemon-infused water helped A LOT. Secondly, when you are about to finish the drink, drain the remaining into the plain water glass instead of chucking the drink from its own glass - that way it's less sweet because the non-dissolved glucose remains at the bottom of the first glass. And of course, chug it down the back of your throat where the sweet tastebuds are less - you do know the anatomy of your tongue right? The test result will only be made known in two weeks' time, but my doctor told me that I had already almost flunked my baseline test (the blood test before the OGTT) - my reading was 5.8, whereby a 6 means that I am for sure having GDM (gestational diabetes mellitus). She warned me that my post-test will surely show that a higher reading, but I shrugged it off as 'one of those PCOS-thing'. Like I said, I knew it already. Note: The baby is doing fine, growing at the right pace and still very active alhamdulillah. I can't wait - 7 more weeks or less to go!